Wow! Disney went and bought out Marvel Entertainment for $4 billion. In a blockbuster deal that brings together two of the biggest brands in American film, animation and comic books, the Walt Disney Co. has agreed to acquire Marvel Entertainment for $4 billion in cash and stock. The sale now puts such classic characters as Mickey Mouse, Donald Duck and Wall-E in the same entertainment stable as world famous superhero characters like Marvel’s Spider-Man, the Fantastic Four and Iron Man. Aside from the revolutionary possibilities across publishing, merchandising, TV cartoons, and the successful Marvel movies, I wonder what this means for the Marvel-character-themed rides at Disney's theme-park competitor, Universal Studios? Reading these books is kind of like watching a Disney movie. My kids and I both enjoy them, but we are laughing at totally different parts. I loved the Narrator and references in this book to A Chorus Line, Grease, and Phantom of the Opera. My daughter doesn't really get that, but it doesn't matter to her. She loved the references to High School Musical and the situational comedy. I love that Tricia describes herself as a "non-practicing librarian." Doctors get to say that ... why not the rest of us? Did you read comics growing up? Like crazy! We were more of a “strip” house, though. Major influences were Prince Valiant and Flash Gordon (our dad had the bound collected editions), Peanuts, B.C., Wizard of Id (courtesy of our eldest brother), and later Bloom County, and, of course, Calvin & Hobbes. Jenni had a brief Cathy phase, which she regrets, and Matt went through both a Ziggy and Garfield period. Does any sibling rivalry ever rear its head? Nah, because Jenni always gets her way (she’s older). How did Babymouse come about? Jenni was pretty unimpressed with most of the female characters that were in comics when she was a kid. So, we were both living in New York City and she had a bad day, and this image of an irritated little mouse popped into her head. She scribbled it onto a napkin and gave it to Matt. And—voila!—Babymouse was born. And then Matt promptly lost the napkin (way to go, dude). You’re now on your eleventh Babymouse book. How long do you see the series continuing? As long as Matt can keep drawing! When his hand falls off, it’ll be hard to keep up the same schedule. ... Princess Sparkley enjoys these Babymouse graphic novels by Jennifer and Matthew Holm. For her birthday, one of her grandma's sent her a check. She decided to order this t-shirt she's wearing below from Cafe Press and buy the newest Babymouse book (since she'd already read the rest). We had to wait until today to get the book because today was it's release date. And Borders didn't have it. But it turned out they did. There was no party at midnight last night. No lines of hyperactive little girls. It wasn't on disply as a new release. They checked the store inventory and saw that yes, they were supposed to have it, so they went in back and found it for us. Nothing exciting, but she got her book. When we arrived home Jed congratulated her on getting her first book on its release date. Can you tell we're bookworms over here? She's already read it. Probably twice. Whew! Now THAT's an adventure in book-buying! Yes, Babymouse fans, our intrepid heroine's 11th adventure--BABYMOUSE: DRAGONSLAYER--is now on sale! To kick off the debut celebration, we have an exclusive interview over at Cynthia Leitich Smith's blog. The interview is part of a series Cynthia is doing with various authors on "Craft, Career & Cheer." Check them all out! ...You wouldn't think joining a mathlete team and training for the math olympics would be the jumpstart into a great fantasy adventure, but then again you may not be familiar with Babymouse. She can imagine just about anything! Do I have a favorite part of this one? ... I think I knew we were made for each other when she opens up her locker--(a locker she has a love/hate relationship with by the way which brings me back to my own school days, but that's a whole other story) and finds herself in Narnia. Also check out her review of BABYMOUSE: THE MUSICAL. 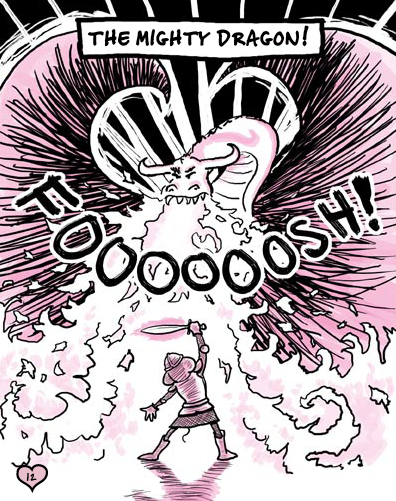 And remember: ONLY ONE WEEK LEFT until the debut of BABYMOUSE: DRAGONSLAYER! Only 12 more days until BABYMOUSE: DRAGONSLAYER is released! Here's an awesome BABYMOUSE: OUR HERO statue created by one young fan! I love love LOVE the boots. So awesome. And did you see how huge this statue is? That's a 5.5-inch tall copy of OUR HERO in the background! Her mom writes the blog UnCooked Art, and is an artist and Live-food chef! Always glad to get the attention of a foodie family! 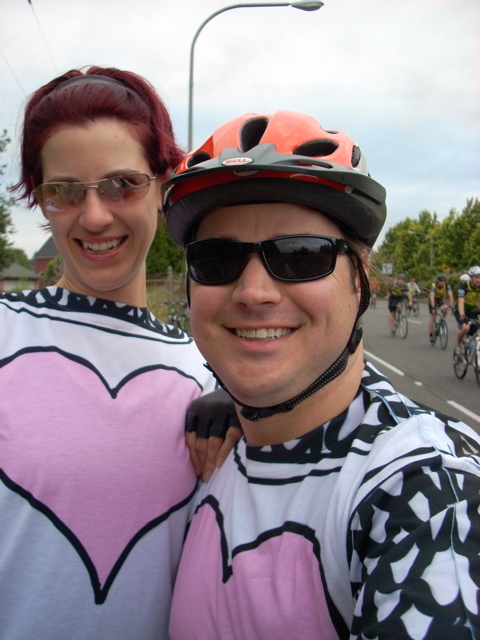 My wife, Cyndi, and I biked the full 11-bridge ride of the Providence Bridge Pedal in Portland yesterday. That amounted to 47+ miles, including getting to and from the start and finish lines. Yow! We joined 18,000 cyclists, each of whom followed one of three courses with varying numbers of bridges. 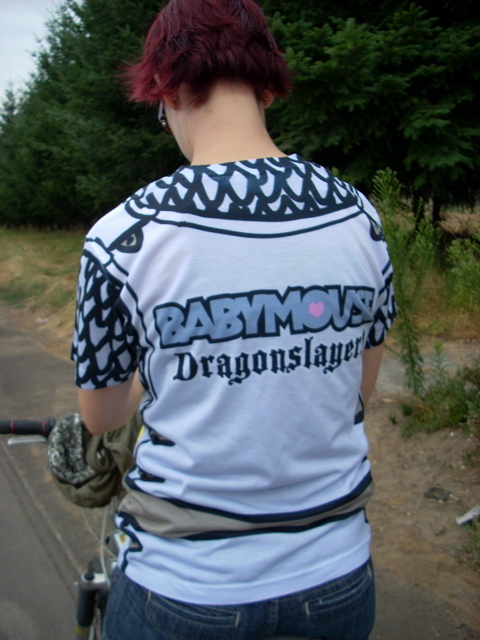 At any rate, we decided to put on our BABYMOUSE: DRAGONSLAYER armor for the ride. Check it out! I just came across a cute post at Peppers and Pollywogs about "Babymouse Party Ideas" (especially slumber party ideas). Check it out!